The UM 900 is a phantom-powered multipattern tube condenser mic, with five switchable pickup patterns, a high-pass filter and onboard pad. This was the world’s first phantom-powered tube microphone. [A]n internal ‘switching power transverter’ generates the anode and heater voltages for the valve preamplifier, as well as the necessary capsule polarisation. There is no information on the valve used, other than that it is a sub-miniature, low-noise type. However, an operational amplifier is used to drive the output transformer. The mic’s unusual lollipop-style design is intended to reduce unwanted sound reflections from the body toward the mic capsule. The dual large-diaphragm capsule is Gefell’s M7 design, employing PVC (plastic) membranes. The tube is either a DL651 or DL67. Both are subminiature tubes (B5A base) first released in the 1950s. The UM900 has, in addition to the -10dB pad, an unusual +4dB mode, which disables the pattern-selection switch (perhaps the amplifier circuitry cannot drive both diaphragms in this mode?) and raises the sensitivity of the front capsule to 40 mV/Pa. 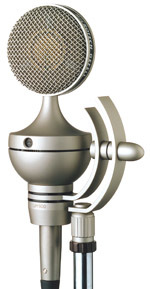 The mic is available in a variety of colors and configurations. Finishes include dark bronze, satin nickel, and a 24k gold anniversary edition. All ship in a wooden storage case with either no clip (€3630), a yoke mount (p/n MH 80; €3490), or a suspension mount (p/n EA 92; €3630 in aluminum case rather than wooden box). The UM900 might look unusual, but its sound is truly sublime. The valve preamplifier makes itself known by adding a subtle but characteristic rich warmth to the sound, without imposing noise or any obvious spectral imbalances. 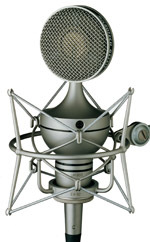 The high end comes across as sparkling and detailed, although comparison with a B&K small-diaphragm mic reveals that, rather than having a truly open and extended range, the gentle emphasis on the 4-12kHz region creates this character as a compensation for the rapid curtailing of response above 15kHz … the mic sounded completely natural and acceptable on all the acoustic sources I tried, which included Bosendorfer grand piano, guitars, and various male and female voices. The Microtech Gefell UM 900 is also known as: UM900.